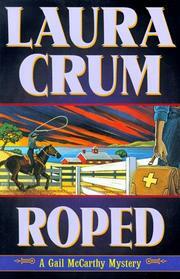 Roped ($22.95; Sept. 11; 240 pp. ; 0-312-19325-4): Warning for horse-lovers: Equine casualties outnumber the human kind when veterinarian Gail McCarthy, in her fourth case (Roughstock, 1997, etc. ), looks into her school friend Lisa Bennett’s fears that a series of accidents to horses entered in roping events aren’t so accidental.